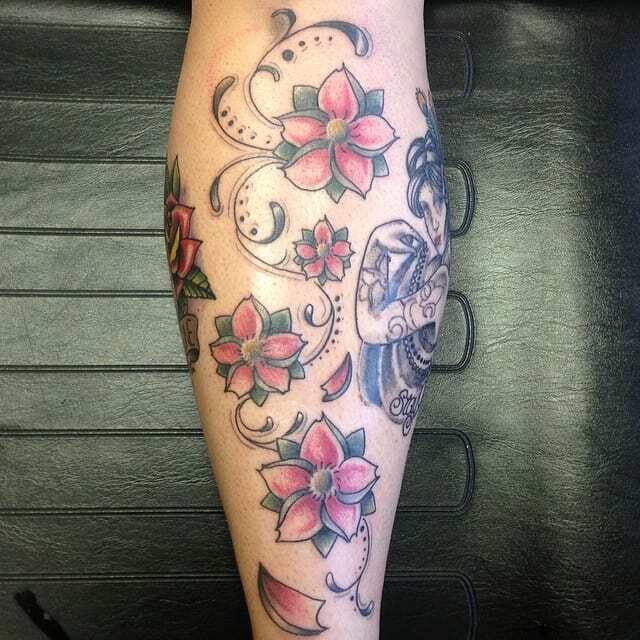 Floral designs have been the eternal favorite in tattoo art, partly because of the extensive variety available in them in terms of types of flowers which can be inked as a tattoo. 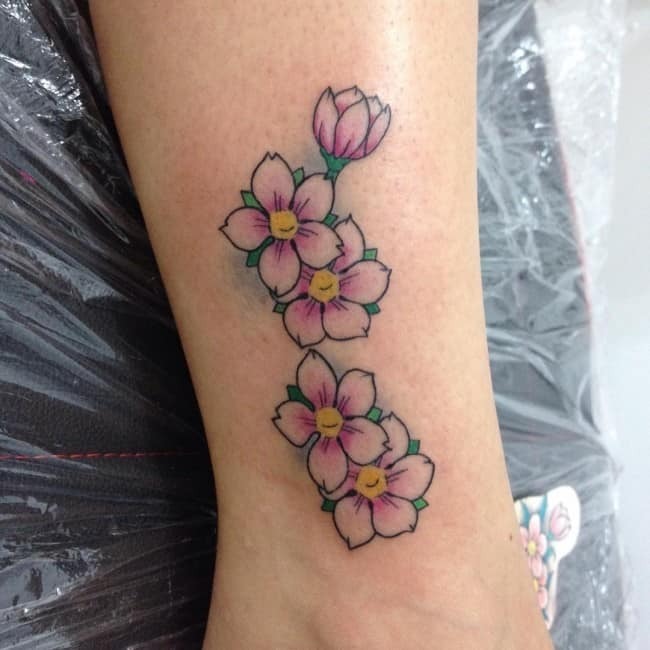 One of the most popular floral designs among tattoo enthusiasts around the globe is cherry blossom tattoos. Cherry blossoms are vibrant pink colored flowers which grow on cherry trees, which are common in regions of West Asia and East Europe. Additionally, they are of symbolic importance in the Japanese and Chinese culture. There is a very positive and beautiful meaning associated with these pretty blossoms as they stand for the arrival of spring. The popularity of cherry blossom art is attributed to their aesthetic beauty as well as symbolic value. They are getting more and more popular every single day. 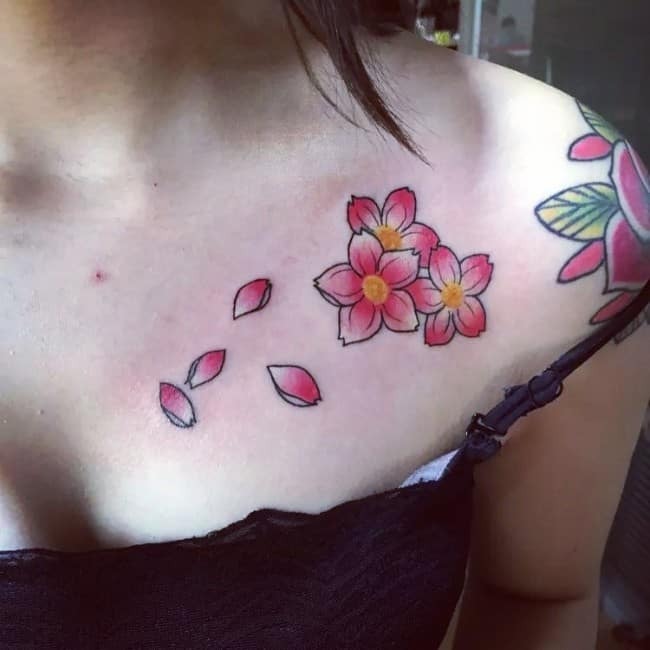 It is simply because more and more people all throughout the world are considering to have flower tattoos engraved on their body, and a cherry blossom art design is one of the most preferred options. Just in case you do not know, a cherry blossom flower is pink in color, and this is not the usual type of a flower which is only growing below the human height. Yes, you read it right. The cherry blossom flower blooms from the cherry blossom tree, which could grow like the typical tree that exceeds human height. Such flower is commonly growing in the regions of East Europe and West Asia. 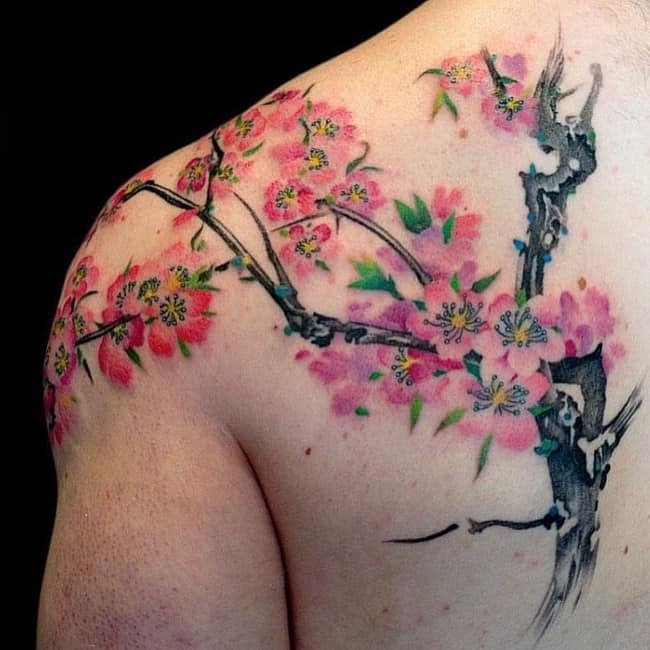 Yes, a cherry blossom art is undeniably one extremely beautiful body art that you can have in your life. You just have to find the finest tattoo artist in town who can help you with such thing. 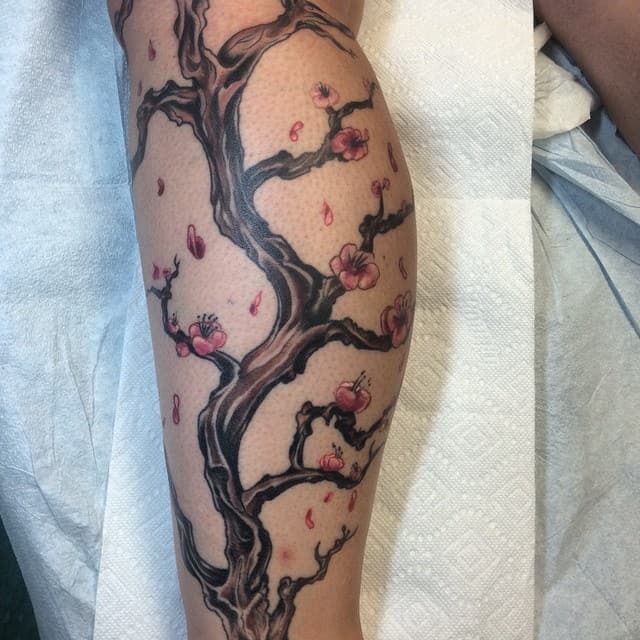 Even so, do you know that a cherry blossom art is more than just a body decoration? It is simply because a cherry blossom flower is signifying a lot of things. Let’s try to know the important meanings and symbolism of cherry blossom. Beauty – A cherry blossom flower is symbolizing beauty, and there is no question about that for sure. Do not try to make things difficult here. The explanation is just literal, and it is because a cherry blossom flower is something that will mesmerize you. Optimism – What do you think why a cherry blossom is being associated to optimism? Well, the explanation is actually very simple to understand. The cherry blossom flower only blooms when spring time is about to come. Meaning to say, the cherry blossom tree has no flowers if spring is not yet coming. When you relate it to your life, there are times that you are in hardships. However, you keep on hoping because you know that you will have everything you need someday just like the cherry blossom tree that will fully bloom when spring is about to come. The key here is you are being optimistic. Love – In case you think that only rose and lily flowers can represent love, then you are definitely wrong. Even though a cherry blossom flower has a pink color, it is also a great symbol of love. In fact, cherry blossom flowers have been part of many couples’ lives in the past years and even up to these days. Impermanence – Another meaning of a cherry blossom flower is impermanence. It is reminding the entire humanity that nothing is permanent in this world. You might be having a tough time now, but soon enough everything will be alright. This is actually where optimism comes in. 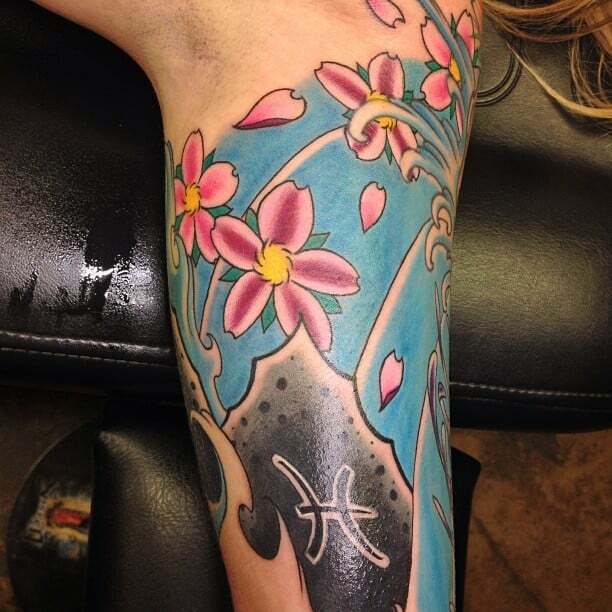 Strength – A cherry blossom flower also represents strength. It is simply because a cherry blossom tree can stand the test of time and remain standing despite of the bad weather that may challenge it. It will be standing there right where it is growing until its flowers fully bloom when spring season is about to come. Some other things that a cherry blossom represents are nobility, prosperity, renewal, fragility, purity, life, fertility, and femininity. In Japanese culture, a cherry tree stands for fertility and nobility, there was a time in the distant past of the country, when people who ranked high in the society, were invited in events to see cherry trees in full bloom and appreciate their beauty. It is also regarded as the symbol of Samurai, the Japanese warriors, as they possessed the quality of bravery along with nobility. The reason behind this is that the tree of cherry plant is strong and steady while the flowers are sweet and delicate, combining two entirely different qualities. In Japanese culture, cherry blossom flowers are also associated with impermanence, because beautiful as they are, these flowers do not last long and their beauty should be appreciated while they are in bloom because these flowers are short lived. In Chinese culture, these pretty blooms symbolize life, beauty and femininity as they harbinger the luscious spring season, stating that the gloomy winter has come to an end and it is time for a new beginning. Cherry blossoms are also considered to bring good luck to a person, which enables them find good luck and happiness in their lives. Cherry blossoms are used as auspicious flowers in wedding ceremonies because they are supposed to bring happiness and success in love life and ensuring that the couple will be able to get bliss and joy of togetherness forever and ever. In this way, this alluring flower has an amazing symbolism associated with it, which is one main reason why men and women around the world want to get these tattoos inked on their body. 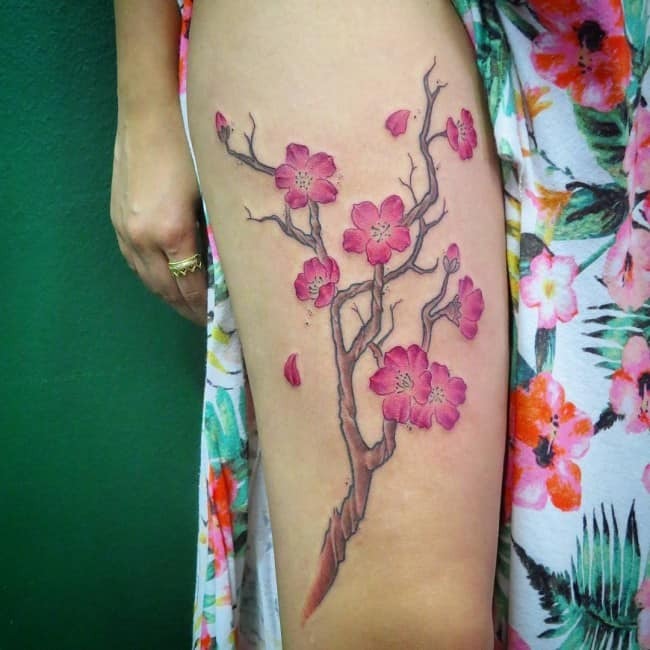 Cherry blossom art on Thighs – In case you do not want to expose your to everybody due to some important reasons, then you can have your tattoo placed on your thigh part. It will only be showed when you are only wearing underwear and maybe, shorts. 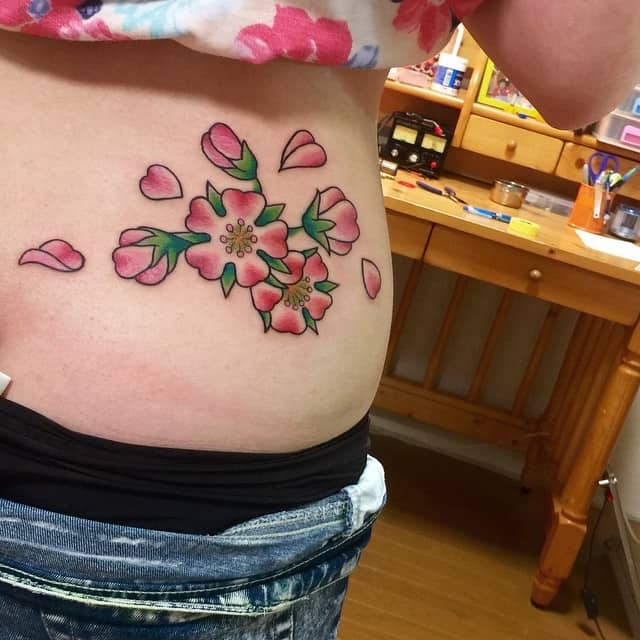 Cherry blossom art on Back – In case you do not know, most of the gorgeous designs of the cherry blossom art need bigger and wider space of your body. This is the main reason why your back is one perfect place. You can choose to have your full back, the lower back, or the upper back. It is all up to you to decide. 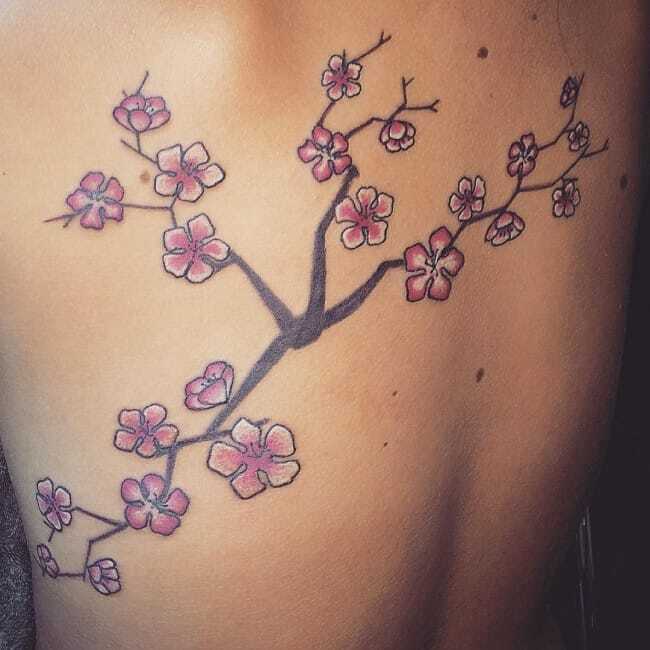 Cherry blossom art on Chest – For those men who want to have a tattoo on their body, the chest part is perfect for the tattoo design since men has wider flat chest. Women can still have it on their chest actually, but the size would be smaller than to those of men. Cherry blossom art on Back of the Neck – In case you just want to have smaller size of a cherry blossom designed tattoo but you still want to expose it to everyone, you can choose to have it engraved right there at the back portion of your neck. There is no way it won’t look amazing there. The variety in cherry blossom art is extensive and you will find them in small and large sizes. The size and design of the tattoo play a key role in determining their placement. 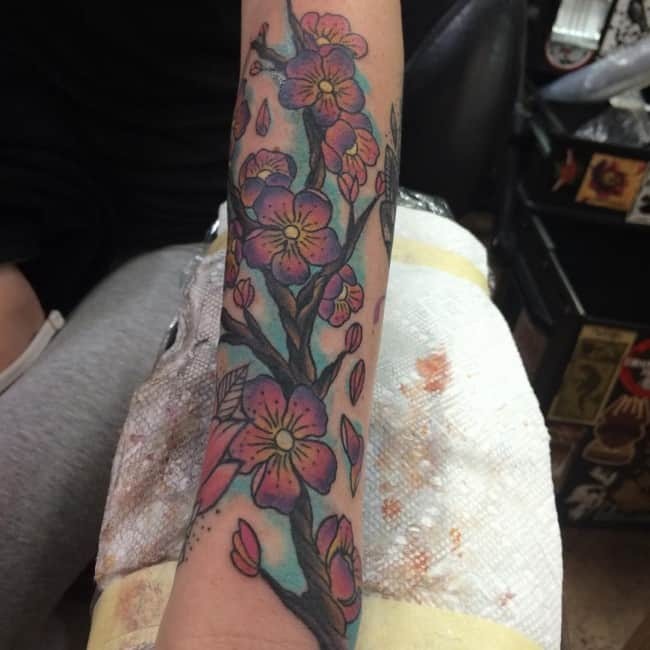 Cherry blossom is a much sought after flower tattoo design in the traditional Japanese tattoo art. In Japanese culture, this pretty and delicate flower stands for transience as it blooms for a short period of time, which represents the temporary nature of life and beauty. On the other hand, in Chinese culture, the cherry blossom stands for femininity and love. In traditional tattoo designs, cherry blossoms can be seen along with wind or water, as whole or in the form of petals. Another significant fact about cherry blossom flower tattoos is that they are smallest in terms of design coverage. 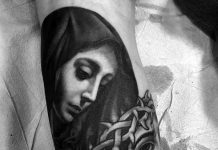 The popular placements of are the lower back, shoulders, arms, legs, wrists and ankles, all of which are highly visible areas, which are just right for a graceful and elegant tattoo art. Known as Sakura in Japan, cherry blossoms make a blessed choice of tattoos in this culture, which considers the flower very beautiful as well as meaningful. There are a number of Japanese designs, which depict anything ranging from a full-fledged cherry blossom tree to the beautiful pink flowers. Some other popular versions of Japanese cherry blossom art are a cherry blossom growing in the winter snow and falling petal of the flower. The designs focus on the fact that the beauty of these flowers is short lived and should be appreciated while it is these. In the similar manner, all situations in life, good or bad are transient and we should try to enjoy every passing moment of life. Most of these designs are featured in vibrant pink color, which gives them a beautiful and feminine look. Chinese cherry blossom art stand for femininity and are a hot favorite among women who want to celebrate their beauty, independence and courage to overcome all hurdles they face in their lives. In China, cherry blossom is known as a herb to boost sexual prowess, a fact which links these tattoos with sexuality and sensuality. Chinese designs combine these colorful flowers with elements like butterflies, bees, water and birds, to add to their attraction and make them more meaningful. 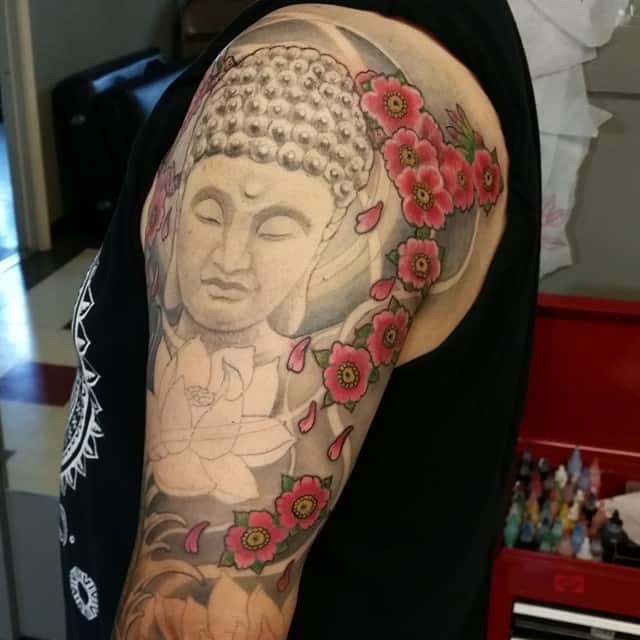 Besides being popular in Japanese and Chinese symbolism, they are revered in Buddhism too as the religion links these flowers with wisdom and spiritual enlightenment. The flower inspires the bearer about the precious quality of life and how he should try to seize every moment, because life, like a cherry blossom is impermanent and you should make the best of it while it is there. 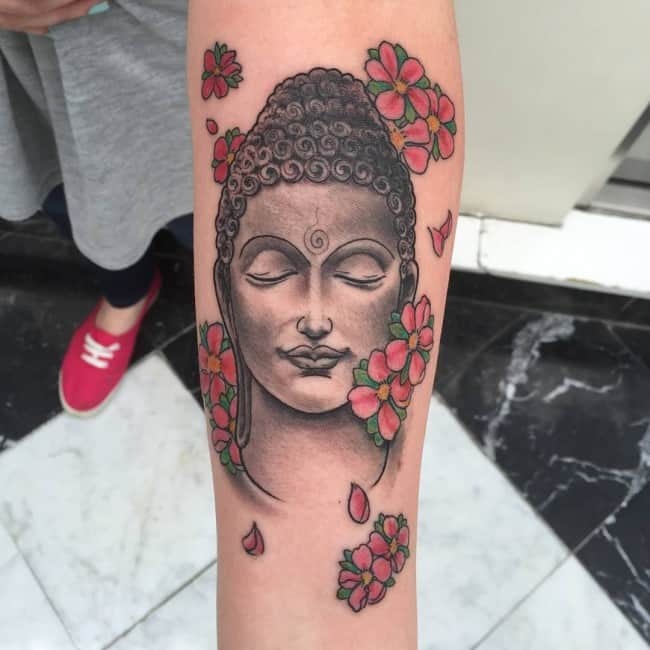 Practically speaking, flowers have always been associated with women, which means that it is imperative to relate flower tattoos with women too, but actually it is not so, with an increasing number of men taking their pick among different floral tattoo designs. 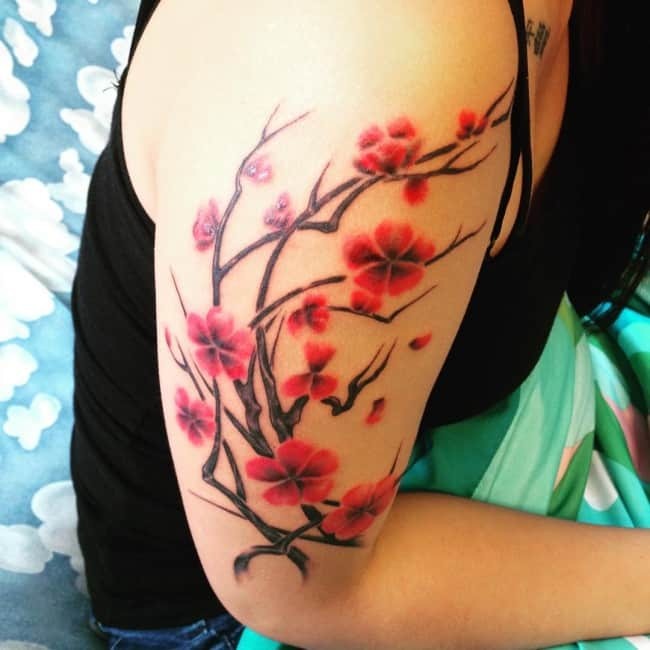 The placement of cherry blossom flower tattoo depends upon the kind of design chosen by the bearer and most importantly, its size. Larger ones are done on large areas like chest, lower back, stomach, spine, legs, ribs, sleeves, shoulder, thighs, hips, breast and under the breast, while smaller ones look good on arm, forearm, ankles, wrists, collar bone, elbow, back of the neck, face, spine, hand, foot, ears and even as finger tattoos. 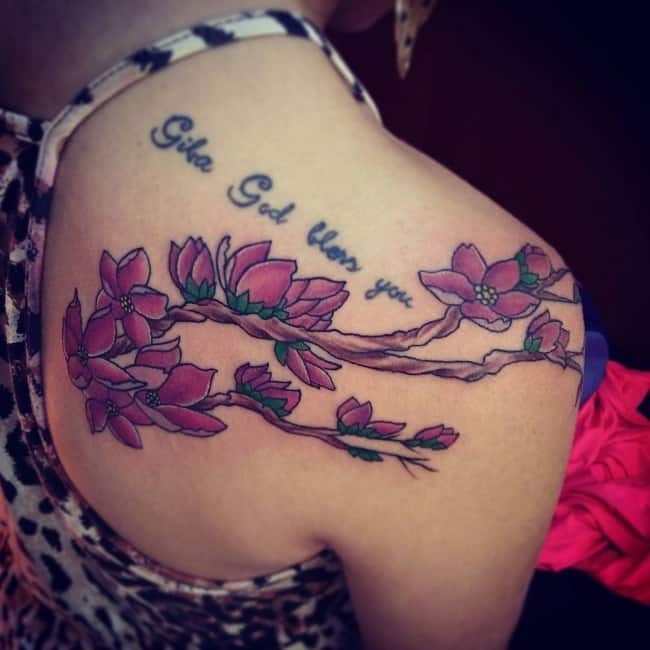 Cherry Blossom tattoo designs may be single or in clusters and may be combined with objects like thorns, dream-catchers, feathers, butterflies, birds, vines, anchors, arrows, ladybugs, quotes or even the names of the bearer. 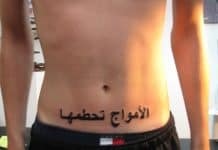 Men can go for tribal tattoo designs, which can combine masculine objects like a dagger or a skull in the tattoo design. One can chose a design which matches one’s taste in terms of design, color and size. The versatility of flower tattoos make them ideal for both the sexes as these can look good with objects representing femininity as well as masculinity. 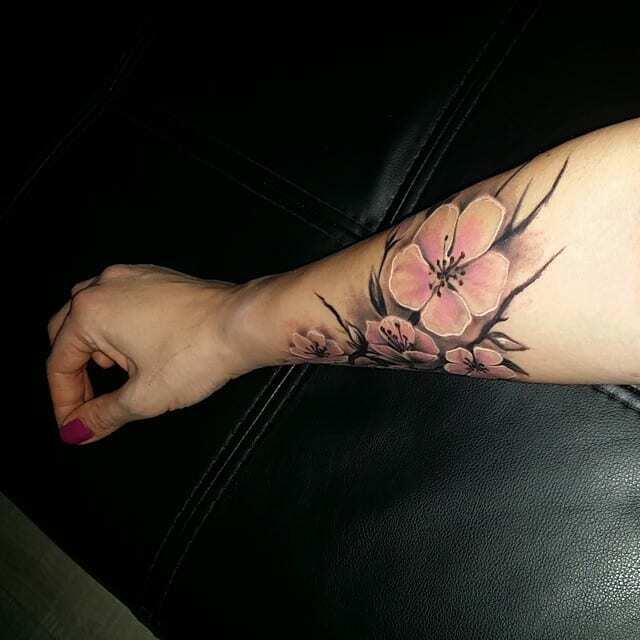 Chinese Cherry Blossom Art – This variation is very common among women tattoo lovers in the world. This is the main reason why this particular variation is believed to exude the essence of femininity. This is the choice of those women who want to emphasize their courage in overcoming every obstacle that may come into their lives. It will also mean that its wearers are very proud for their unique beauty and for the fact that they are independent individuals. Japanese Cherry Blossom Art– Japanese culture has also been associated to cherry blossom since cherry blossom flowers are abundantly growing in the beautiful and progressive country of Japan. In the Japanese culture, this flower is considered to be very meaningful and beautiful. Japanese people call cherry blossom as Sakura. Some famous designs of the Japanese cherry blossom art are falling petals of cherry blossom and a cherry blossom tree that is fully blooming amidst the winter snow. Every design is surely to emphasize the flower’s incomparable beauty and the fact that these flowers may fade away in due time. Buddhist Cherry Blossom Art – The beautiful cherry blossom flower has also been associated to a religion known as Buddhism. According to this religion, this flower is a symbol of enlightenment. This is the reason why a lot of Buddhists in the past years and even up to these days are engraving this art on their body. Buddhists also believe that life is just like the cherry blossom, it is sweet yet a temporary one. Without a doubt, cherry blossom tattoos can be your perfect body art if you just know their significance. Not only that, you should also know where you have them tattooed on your body, so that these will look stunning in the eyes of other people. But if you don’t want to expose it, then choose a specific body part where it can be hide by your daily clothing.